LES FEMMES - THE TRUTH: Thanks to Mothers who Work to Keep their Families Together! Adults are also vulnerable to suicidal thinking and acts after divorce. A 2010 study from Rutgers of suicide among middle-aged Americans found divorce rates has doubled for middle-aged and older adults since the 1990s, leading to social isolation. This study showed that in 2005 unmarried middle-aged men were 3.5 times more likely than married men to die from suicide and their female counterparts were as much as 2.8 times more likely to kill themselves....The million youth per year traumatized by the divorce “plague” deserve more from all of us, as do those adults who have been its victims. Numerous factors have contributed to the depression and marked rise of suicide in youth and adults in this culture. Making and keeping promises is one of the marks of a person of integrity. Unfortunately, many in our culture embrace moral relativism; so today's promise in a particular situation isn't considered binding tomorrow if the situation changes. That's their thinking and the "kids will have to adjust." Thank you to all those married couples who, through thick and thin, have kept their marriage vows, "for better, for worse; for richer or poorer; in sickness and in health; til death do you part." Your witness means something, especially on this Mothers Day. 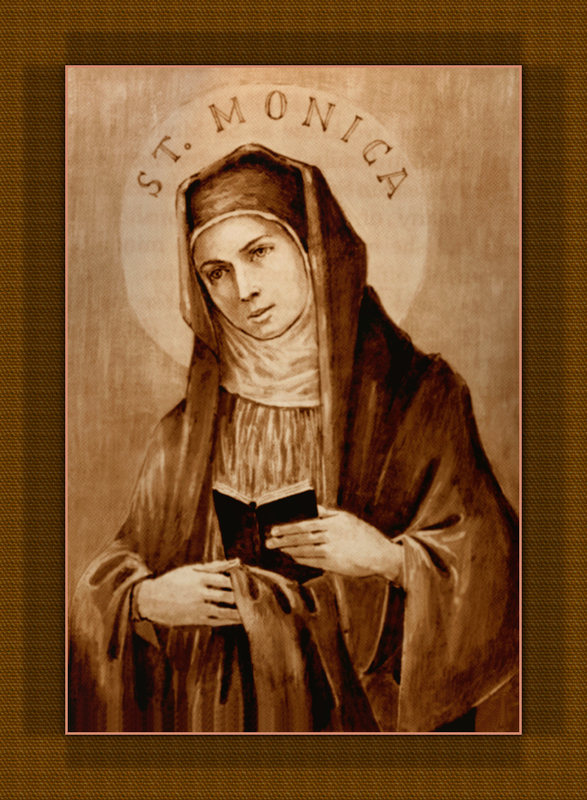 It is often the mother who, like St. Monica, keeps a family together despite challenges and difficulties (and sometimes after abandonment). But there are good fathers out there too who suffer from abandonment and infidelity. May God bless all those men and women who struggle to remain faithful to their marriage vows. God will reward you and your suffering, offered for your family, can be redemptive. Let's all pray for a renewal of marriage and a re-commitment to Holy Matrimony. As we approach the wedding season, don't forget couples preparing to walk down the aisle anticipating a life together. Ask the Lord to pour out his abundant graces on them that they might support one another in keeping the promises of their wedding day.